You saved the date, but have you made reservations yet for drinkboston’s Flowing Bowl Punch Party at Eastern Standard this Monday, June 30? No? You were waiting to hear just what was going to be in those flowing bowls, weren’t you? Well, here are the goods. Jackson Cannon and his talented staff will mix four classic punches and serve them out of traditional bowls in the restaurant’s front lounge and porch area. The featured liquids are Martha Washington’s Rum Punch, Philadelphia Fish House Punch, Milk Punch No. 1 (from the Savoy cocktail book)* and … a mystery punch to be determined. You’ll just have to show up to find out what’s in that bowl. Remember, this isn’t your grandmother’s punch (cheap champagne, ginger ale, orange sherbet). It’s your great-great-great-great-great grandmother’s punch (strong spirits, sugar, fresh citrus, spices). Rest assured that, while these mixtures contain plenty of rum, brandy and other bracing liquors, they are remarkably balanced and not overly sweet. Don your party threads and commune with us around the flowing bowl. To reserve tickets by credit card, call Eastern Standard at 617-532-9100. Tickets are $30 and include servings of four different kinds of punch and passed appetizers. 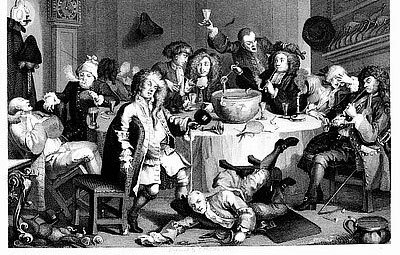 The party starts at 5:30 p.m. and lasts ’til the punch runs out. Want to receive email invitations to drinkboston events? Send a request to drinkboston at comcast dot net. * The recipe for Milk Punch No. 1 is complicated. It involves steeping brandy, Jamaica rum, Batavia Arrack, spices, lemon, pineapple and green tea in boiling water, then adding milk and more lemon, then straining the whole curdled mixture into a container and serving it cold. You have to try it to believe it. The LUPEC Boston cocktail column in the Weekly Dig is slightly expanded for the annual Summer Dining issue, out this week. With the help of my fellow LUPEC broads, Hanky Panky and Pinky Gonzales, I (Barbara West) encapsulate the history of tiki drinks. We start out with this fact, which surprises a lot of people: the tiki bar phenomenon began in Hollywood, California, in 1934 — right after Prohibition. 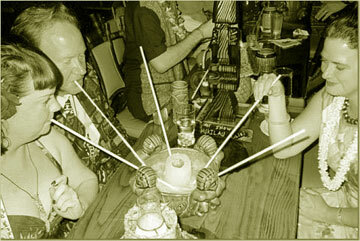 Also, as anyone over the age of 50 can tell you, there used to be a ton of tiki bars in Boston. One of our sources, cocktail historian Brother Cleve, suggested a favorite tiki drink of his, the Shrunken Skull, as our featured cocktail for the column. He and his fellow tiki expert, Jeff “Beachbum” Berry, whose books reveal the original recipe for the Shrunken Skull and scores of other tiki drinks, are hosting a tiki block party July 19 in New Orleans at Tales of the Cocktail. Shake with ice and pour into a skull mug. Top with 1/2 oz club soda. Shopping for rum and other tiki ingredients? Here are some tips. Whether or not you plan on attending Tales of the Cocktail in New Orleans this year, you should check out what the event’s planners are calling the World’s Largest Collaborative Cocktail Blog. It’s collectively written by a group of bloggers who will be participating in and writing about panels and other events at the World’s Largest Cocktail Convention (or, as Scott likes to call it, Macworld for Drunks). 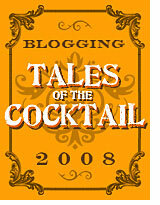 The Tales bloggers are dishing up previews, commentary, interviews and how-to’s on a riot of boozy subjects that may be helpful and interesting to the drinking public at large (not just those who are heading down to New Orleans). 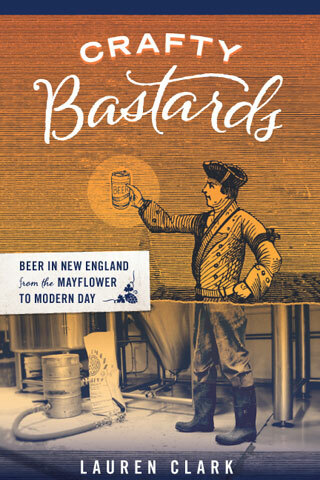 A sampling of recent posts gives you an idea: Death in the Gulfstream — An Underappreciated Hemingway Drink, by Seamus Harris of Bunnyhugs; Artisan Still Design and Construction, by Jonathan Forester of SlashFood; and Getting Your Booze into the News, by some blogger from Boston. In my latest Ms. Mug column for Ale Street News, I make the case for Boston as a great beer town. Writers from Philadelphia and New York City have already weighed in on their respective metropoli. I was more than happy to add the Hub to the fray, as anybody who read Three cheers for beer in the Hub knows. And coming up: a review of Boston’s first American Beer Fest, which took place over the weekend at the World Trade Center. One of Boston’s best bartenders, Jackson Cannon, is the subject of an admiring profile in today’s Boston Globe. Congrats, Jackson — well deserved. Careful readers will notice that one of writer Meaghan Agnew’s sources was … moi.